Securing vacant retail and commercial buildings makes communities safer for everyone. When vacant retail and commercial buildings are not properly secured, they can become hotspots for crime, vandalism and squatters. DAWGS steel door and window guards create an impenetrable barrier that keeps buildings empty and safe, preventing crime and squatters from moving in. DAWGS keeps communities safer and properties secure. 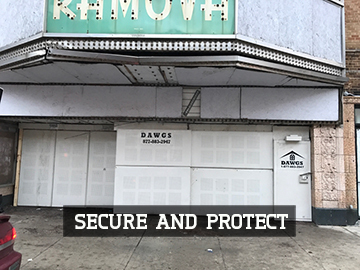 At DAWGS, we work with retail and commercial property owners and managers to provide unsurpassed steel-secured vacant property solutions for all types of projects. DAWGS patented door and window guards provide durability, strength and curb appeal. Our door and window guards come in neutral colors – their unique powder coating makes graffiti removal easy. DAWGS steel door and window guards fight blight and keep communities protected. DAWGS modular design makes them perfect for doors and windows of all shapes and sizes, while coded door guards provide managed access to the property day or night. Click here to get a quote or learn more about your vacant property security options, or call us at 1-877-88-DAWGS (32947).